This morning's release of GDP data suggested that government spending reductions in military have caused a fall in the growth USA's GDP. The third quarter had a growth rate of 3.1%, the fourth quarter showed a -0.1% GDP. Inventories are building, and it looks as though alot of "income" was pulled forward to avoid the fiscal cliff and increasing tax rates. Despite the stock markets being down just a tad, gold and silver are higher, why? The reduction reaffirms what we should all know, that the Fed will never exit and cannot remove their stimulative QE which is shuffling $85 Billion monthly of Federal Reserve Notes between different assets like treasuries and MBS. Intra-day Gold looks to really like the report of GDP contraction as it's ETF proxy GLD is bouncing. Silver also bounced. The key for silver will be to clear through the $32.50 area. Stock charts won't do an intra-day chart for commodities in my set up, so I'll have to post a chart later. In addition, here is a view of silver that is a 1 year look. $36.88 seems a long way away from here, but continued real action by the Fed cannot hurt. If anything, this continues to provide a very solid "fundamental" base from where silver will mount an attack higher. I watched this video of Nathan Fletcher and I begin to think that this is a picture of the US economy. We're about to drop into this extreme ride, yet don't know what the outcome will be. Bernanke thinks to himself, "no matter what, I've got to get to the shoulder...."print, print, and buy MBS....or I'll hit the reef and die. The ride has begun, who knows what will be the outcome. Enjoy. If I was a younger man and I had to live life over again, perhaps I'd have gone to college in California and done something like this for a living. Ever wonder what happens when there is a believable threat of government intervention into a market? I took a trip to the local sporting goods store the other day to ensure I have ample supplies for the coming zombie apocalypse. 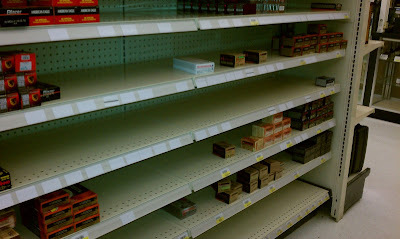 As I reviewed my list, I discovered I was a bit short on stores of ammo for my soon-to-be outlawed Glock 23 with a 13 round magazine. As I wandered over to the ammunition isle I was "shocked" to find that the shelves of the store were bare and void of any .40 caliber shells. It is simply disturbing to think that all those gun nuts out there are swarming stores to get themselves stockpiles of lethal lead and copper. I found out also that when and if the store receives new shipments, they will limit the purchase to one box of 50 shells per customer. So, in God's greatest nation on earth you may have the right to bear arms, you just won't be able to fill it up with any projectiles. I'm a bit torn. I'm very busy and yet I feel the mounting pressure to post my predictions for 2013 and also do a review of 2012. If you have a moment read my post, CONFIDENCE LOST - 13 for 2012 where I make a few predictions about how the year would turn out. I will probably come back and do a formal review, but the truth is, it doesn't matter, the year is over. The score is that I felt like it would be a negative year in markets and that was wrong, but overall I hit about 8 or 9 of the 13, and especially made some good calls that made money. It is fun to document what I'm thinking, so I will do a brief bullet point list for 2013 this weekend so we can look back and laugh about how good or how silly I've was in the beginning part of the year. As we bask in the glory of the financial cliff deal and are joyous about how we'll continue to keep deficit spending rolling for a few more months, I thought I'd give you some weekend viewing pleasure that highlights the wonderful experience of some friends across the pond. The Spanish were truly folks that were completely swallowed up in the housing bubble and they have suffered greatly from its bursting. The video is a wonderful one as it really highlights how middle class families and unrelated industries get crushed when markets, investors, governments, and regular people suspend their sensibilities and assume that price increases can go on forever and that they are smart enough to exit before the collapse.